Editor: A version of this article originally appeared on the now defunct SDNN.com. With the Chargers’ season over, and the chatter about the L.A. stadium proposals generating a lot of attention of late, we thought we’d revive the debate here. There’s a common misconception that a new NFL stadium for the Chargers is strictly a Chargers issue. That since the Chargers stand to gain the most from building a new stadium, then they should be entirely responsible for paying for it themselves. And if they’re not willing to do so, then they should just leave. The city will survive without them. And although that may be true—that San Diego will go on without the Chargers as it has gone on without the Rockets and the Clippers—it is extremely shortsighted to look at the stadium as merely a Chargers issue, as if they’re the only ones affected. They’re not. And it’s about time folks started to understand that. But even that is only a small part of the economic impact a stadium brings to our city. San Diego is a tourist destination, so a significant chunk of our local economy depends on brining in tourist dollars. By losing an NFL franchise we lose an awful lot of free advertising on national (indeed international) television. When CBS, Fox, NBC, or ESPN broadcasts a game from San Diego in December or January they include video panoramas of the harbor, our beaches, and the skyline. Images of a cloudless sky and 75 degree temperatures get beamed across the world. And when commentators like Al Michaels declare that the NFL should hold the Super Bowl in San Diego every year while telling the hundreds of millions of viewers about the clear blue sky and the 90 degree day we are experiencing at the end of January while more than half of the United States is buried under three feet of snow; well, there simply is no better endorsement of our city than that. And about the Super Bowl: There is a lot of debate about the actual economic impact hosting that event has on our city. The NFL says that the 2002 game had an overall economic impact of over $300 million. Detractors claim it was less than $100 million. But whatever figure you believe it is undoubtedly a huge net positive for our economy in direct numbers. In indirect terms, though, one cannot underestimate the value of having a giant, 10,000 megawatt spotlight shined on our city for two weeks solid leading up to the game. The state of California has spent millions of dollars on a national ad campaign to boost tourism in the state, yet we get even better direct exposure for our city for free! And make no mistake about it: The NFL is dying to bring the game back to San Diego, as it was an enormous success the previous three times it was here. Although the U.S. lost its bid to host the 2022 World Cup, San Diego was squarely on the list of cities being considered as a venue had we been chosen as the host nation. There is little doubt that a new stadium in San Diego would have entrenched the city as one of the 12 chosen sites. It was estimated that the World Cup would have a national economic impact of at least $5 billion, with San Diego reaping between $350 million and $500 million of that haul. We can be fairly certain that the World Cup will be making a return to the United States at some point in the not too distant future, and San Diego needs to be positioned to be a part of it. There’s also a line of thought that the new stadium in San Diego should feature a soft, retractable roof (which would be much less expensive than the typical domed stadium). San Diego would then be eligible to host the NCAA’s Final Four—the national basketball semi-finals and championship games. Houston’s Reliant Stadium is scheduled to host the event this year, and was the host of the Regional rounds of last year’s NCAA Tournament. Last year’s Sweet 16 and Elite 8 rounds are estimated to have generated over $38 million in revenues to the Houston economy, with an expected $60 million from the 2011 Final Four. San Antonio, it is reported, saw approximately $61 million poured into its economy from the Final Four when it hosted in 2008, up from the $55 million it saw from the event in 2004. St. Louis in 2005 reported nearly $72 million in economic impact for the weekend long event. There is currently no venue on the West Coast that meets the NCAA’s standards for the event, so San Diego would be virtually assured of being selected to host. Consider, too, the need to expand the San Diego Convention Center. Mayor Sanders’ Convention Center Task Force recently published a study that estimated that “39.7% of prospective customers that do not book San Diego Convention Center attribute that decision to “Center Unavailable,” or a lack of space.” The study found that in 2007, convention attendees generated $921 million in direct spending here despite an inability to accommodate the largest events. Without the added capacity, San Diego is losing out on a lot of business. The proposed convention center expansion combined with the availability of a downtown stadium for added space would guarantee that no event is too large to be held in San Diego. When not being used for sporting events, the stadium floor itself could be used as a convention venue, not to mention the various club lounges and skybox suites that can be used to entertain smaller break-out groups as a part of the larger event. Without a new stadium, San Diego will be limited in its ability to play host to our country’s biggest sporting events. The U. S. Open, which was held at Torrey Pines in 2008, only comes around every so often……actually, it has only made its way to America’s Finest City once (compared with three Super Bowls), bringing with it an economic impact of $142 million. Since just about every other major sporting event requires a top caliber stadium, San Diego would automatically be out of the running. The impact of losing the Chargers must also be considered. What message does it send to business leaders around the country about San Diego’s ability to support their business when we’re unwilling or unable to support an industry that brings as much attention to our city as the NFL? I know, I know……L.A. has survived without the NFL for more than 15 years now. But I’ve got news: We’re not L.A. L.A. still has two basketball teams, two baseball teams, and two hockey teams. And Los Angeles is still the epicenter of the entire entertainment industry. San Diego can claim no such distinction. Critics abhor the idea of using any kind of public funds to build a stadium for a “private enterprise.” But the Chargers are more than that; they are a public asset in terms of the civic pride they generate in the community at-large and the revenues they help to create. Yet a stadium can be more than just the team that calls its field home. With the right location, a stadium can become a significant part of the economic engine that drives the city. There’s also the $17 million the current Qualcomm Stadium drains from the city’s coffers to take into account. The city absolutely should not bear the financial responsibility alone, nor will it. But since the city stands to benefit from the presence of such a facility, the tax increment bonds that would be issued to help build it should be considered an investment in the overall economic viability and vibrancy of our community for years to come. An investment in a stadium is an investment in the future of San Diego. I feel like this is a matter of choice under constraint with the current budget crisis. My understanding is that football stadiums (or stadia, if you prefer) have a much lower ROI than, say… a baseball stadium, basketball arena or a convention center. They just don’t play that many games, and much of the activity around those games concerns people tailgating with their own food and beer, rather than going out and spending money nearby shops and restaurants. You might get a few special events, concerts and monster truck rallies or whatever, but I think if you look at the actual numbers and full impacts, while considering the opportunity costs of using those funds in a different area (convention center, urban parks, maybe even schools), it’s really not that much of a winner for San Diego compared to the alternatives. While nothing is engraved in stone, it looks like the end is near. Andy, is it possible to sum up all the projected gains you think the stadium will bring the city and then use that number to calculate an ROI? In other words, how much is it going to cost the city versus how much is it going to bring in? I realize the projections won’t be precise, but if you could provide a ballpark estimate (sorry, couldn’t resist!) of the total costs versus total benefits, I think it would add a lot to your case. No, I really can’t. I’m not an economist or an accountant, and the numbers I used for the piece are from other sources. They’re mostly examples of what is possible. There’s also the problem of measuring the secondary benefits–how many people decide to visit San Diego because of the attention brought by some of the cited events? How do you measure such an effect? Also keep in mind that most of the argument in favor of the stadium is based on the downtown location adjacent to Petco Park and across from the Convention Center. In my estimation it’s the site that has the MOST potential to be a revenue generator for the city. In the final analysis the City and the Chargers are going to have to make the case that the city will tangibly and directly benefit from making the investment. 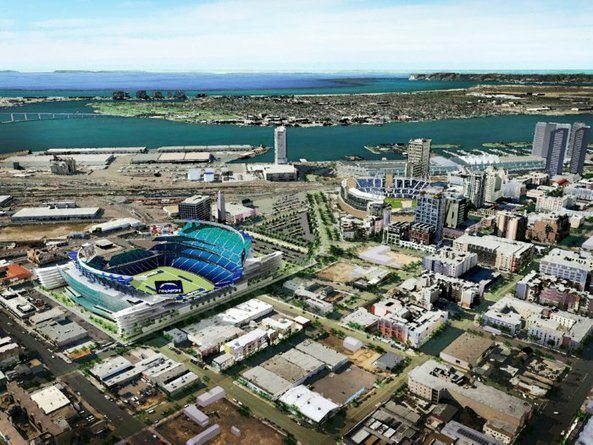 And if the case cannot be made, then there will be no new stadium downtown and the Chargers will be gone. Based on the information I included above, I believe that they will easily be able to do this. But you have to look beyond just football and the Chargers. There are a LOT of ways to use a facility of this type to spur revenue generation for the City, but it’s gonna take someone a lot smarter than me to give you specific numbers. But just looking at it in general terms, to me it’s a no brainer. 1. Can anyone name a single business that set up shop in San Diego (or any other city) based on the fact that an NFL team plays in the city? 2. Anyone ever met a single tourist who came to San Diego (or any other city) because they saw how nice the city looked on a broadcast of a sports game? 3. Is it realistic to bank on a new Charger stadium leading to the city hosting the World Cup, an event held every four years, and one that every major international city competes for? 4. Isn’t the first potentially available World Cup in 2026, 15 years from now? 5. Didn’t we already recently host a big part of the NCAA college hoops tournament at SDSU? 6. What other events would be held at the new Charger stadium that could not be held at Qualcomm stadium? 1. I doubt it, at least when considering major business – but there are plenty of sports shops in malls across the county that would probably be a lot smaller and do a lot less business without merchandise to sell to fans of the hometown team. Sports to me are a source of civic pride, when the Chargers move I’ll stop following them, but I won’t pick up another team based on the fact that I support San Diego based on the fact that it’s where I’m from…so those shops will lose my relatively meager contribution to their sales. But I’m sure having a resource like major sporting events does play at least some role for major companies deciding to place a regional office, as it gives them opportunities to entertain and network with clients. 2. I’ve met more than I can count – I had season tickets for 11 years, and every single game I met road fans (I sat in the cheap seats that were usually the last to sell and thus went to out-of-towners making single game purchases) that decided to vacation in San Diego based on positive TV coverage. I could certainly understand a Cleveland fan who travels to one road game a year choosing to escape to California in the middle of winter instead of making their football vacation a trip to another snowed-in destination like Green Bay or Chicago. It’s part of why there’s always been a much larger contingent of ‘away’ fans in the stands here as opposed to other areas. I traveled once a year myself for 8 years, and there were rarely more than a few hundred Chargers supporters in other towns, compared to ten thousand or more who flock here. And these people aren’t just paying for the game, they’re renting hotels and cars, eating in restaurants, and taking in the other tourist attractions in the days surrounding the game. 3. I wouldn’t bank on it, but I think there are enough other factors that make San Diego attractive to at least put us on the list of the top dozen or so sites worldwide. 4. I’m not much of a soccer fan, but I do know they make their commitments pretty far in advance, so I wouldn’t doubt what you’re saying. And even IF (big if) we got a World Cup, it would almost certainly be a one-time deal, so I don’t think it’s what makes or breaks the feasibility of the stadium. 5. We hosted a regional round – but with a 12,414 capacity the facilities at State are barely big enough for the lower-tier rounds of the tournament. No way they’re sufficient for the crowds that gather to watch the big boys play in the finals. 6. I think the main idea being floated is including a retractable roof that could convert the facility into indoor convention space, thus adding to the convention center. That much extra area would pretty much ensure Comic-Con isn’t going to outgrow SD in the forseeable future. You make good points Shane, and I don’t have all the answers for sure. I don’t even know that I can support a stadium given our current budget situation. But I do know from experience at a handful of other stadiums in the league that ours is (almost) the worst I’ve seen…the funny thing is that the absolute worst is Gillette Field in New England, one of the newer facilities. Other than the location in the middle of nowhere (Foxborough is WAY out in the boonies), I actually like Gillette Stadium. It has a few flaws (mostly functional for team purposes), but for the fans it’s pretty good. You should have seen old Foxboro Stadium, though. Talk about BAD!!! It was nothing more than a high school stadium on steroids. Horrible concessions and confusing pedestrian ramps to get to the upper level were what really turned me off at Gillette – I visited the bathroom and the beer stand once each and missed nearly a quarter. In Atlanta, you can walk out of the stadium, use the restroom, buy a beer, and be back in your seat in the span of a TV time out. 1) Elite Show Services. They started out just doing security for Chargers and Padres games, and have grown into the largest provider of private security services in the county. Without the Chargers, they probably wouldn’t exist. Sports Fever in Fashion Valley might exist, but they certainly wouldn’t be thriving as they do now. I can tell you with 100% certainty that the Chargers themselves refer A LOT of business their way, and they are probably the best place to find Chargers jerseys, hats, shirts, paraphernalia, and more. They make a TON of money off of Chargers merchandise. No Chargers, and their business shrinks considerably. 2) Yep. Many. A Charger game on TV is a 2 1/2 hour advertisement for San Diego. And remember that NFL games are ALL televised. Every. Single. One. That’s part of the TV contract, so the games are seen all over the country. 3) Bank on it? Perhaps no, but I would think that the likelihood is very strong. As it was, we were on the list of finalists for the U.S. bid for 2018 and 2022. As noted, estimates for the World Cup had the economic impact at over $350 million for San Diego alone. But more importantly is the Super Bowls. You CAN bank on the fact that the Super Bowl will be making a return to San Diego with a new stadium. More than once. That is a certainty. 4) Yes, but the bidding will be done in 2018 (like the bidding for the 2022 games was done a few months ago). I’m also not convinced that Qatar will be able to hold up its end of the bargain for 2022, and FIFA may be forced to move it. If that’s the case, then the United States is uniquely positioned to quickly and easily take over. 5) NCAA First and Second Rounds. Without a top flight arena/stadium, we’ll never get beyond that, if we even get that again. NCAA standards for hosting the Final Four now requires a domed stadium with a large seating capacity. Smaller sports arenas that have held the event in the past need not apply, as they will be dismissed summarily. What we want is a facility that they will consider for the Regional rounds of the tournament (second weekend) and the Final Four, and a stadium with a soft roof in San Diego will qualify. Like I mentioned: There is currently NO facility on the West Coast other than Glendale, AZ, that can even be considered for the Final Four. 6) Understand something: If the Chargers leave, then Qualcomm stadium will be gone within a few years. The city cannot continue to operate the stadium without the Chargers (they’re hemorrhaging money on it as it is). Even if San Diego State somehow manages to build an on-campus stadium, or takes over a scaled down version of Qualcomm (a possibility that, for a number of reasons, I find HIGHLY unlikely), we’ll lose both bowl games and even the POSSIBILITY of a Super Bowl. The Downtown location makes the stadium available as an extension of the convention center, which makes it more useful year round. That’s what the current Downtown LA proposal calls for (it’ll actually be a part of the LA Convention Center), and the old RCA Dome in Indianapolis actually WAS a part of the Indy Convention Center. Big thanks to both Andy and Dave for their thorough replies to my questions. Andy, I hadn’t realized that without the Chargers, we will lose Qualcomm – that’s an interesting facet of the debate. Overall, I’m still not convinced the benefits outweigh the costs. Seems like the payoff from big events is less than $100 million a pop (judging by articles’ links on San Antonio’s NCAA tourney, etc) so new stadium would have to host several to offset its $500 million-ish cost. And I know we get a lot of Cheeseheads when the Pack plays here, and other fans come to see their teams play San Diego, but with only 8 home games a year, all that money does not add up to a big dent in $500 million. “The People” just don’t understand. A football stadium downtown allows us to condemn private land we’ve wanted to get our hands on for years, AND get federal dollars for it ! Then there’s the, uh…”revenue” generated from developers just dying to develop it. Besides, we could get rid of that pesky ticket guarantee our lawyers negotiated and black out all the games. By eliminating most parking, people would have to use public transportation and downtown businesses would profit, just imagine the tax revenue from that ! Just think, we could spend that imaginary income on something really big, like a high-speed rail to Los Angeles ! This line in the fourth paragraph tells me all I need to know about this article. It reads, “By losing an NFL franchise we lose an awful lot of FREE advertising on national (indeed international) television. ” (The emphasis is mine.) The fact is that the advertising and boosterism is not free. We paid for it with a several hundred million dollar bond to pay for Petco, not too mention all the free land we gave away as incentives to developers, which still haven’t paid for themselves with the promised, but never delivered tax revenues. We are still paying off the bond for the first stadium and our city is still in debt to its eyeballs. Our schools will be raising the student-teacher ration and did you see the article on potholes? The City is BROKE. The Chargers need to be partners with the City if they want a new stadium, not leeches like the Padres. The owners stand to make millions and they need to invest just as surely as they are asking the taxpayers. The “Los Angeles Chargers”! It has a ring to it. We already have one giant monument to corruption disgracing our skyline, we call it Petco Park. Let’s not make the same mistake twice. Note: The artist has rendered the entire homeless population to soap for Andy’s whitewash! We need to reassert that this is a civil discussion, that Andy has made valuable contributions to this website, and that because you may disagree with him on this issue, the issue itself does not suffice to be used as a subterfuge for un-necessary attacks on the creditability of one of our bloggers. editordude-Methinks you doth protest too much! Danny “big tongue” Morales – (shall we try to use ‘old English’ here?) Tis not the very first time that thou when casting stones at thee issue, hits thee writer as well. ‘dude- …OK I apologize to the injured party. My bull often goes to the china shop. What can i do to compensate for the loss? You must wear a Chargers Cheerleader outfit to the next Halloween party. I think People should get their stories straight prior to printing an article. #1 The Spanos Family originally offered to pay the entire amount of building a new Stadium in Mission Vally. The Plan at the time was to develop Mission Valley and use the profits for the Development to build the Stadium . The city also would have received nearly $10 million a year in taxes for the condos and Office space developed. That plan worked then but does not work now due to the sluggish economy. #2 The so called ticket guarantee. This was no different than the way bossiness’s pay their rent in Downtown percentage of gross revenue The minimum the city would get was 1.6 million a year. If there was a sell out it could be as much as 7 million a year. The idiot Michael Agarie re negotiated this and let the Chargers out of their contract with the city 5 years early. #3 The guarantee only had 1 year left at that time and all the games were selling o9ut anyway. #4 The city would have been getting nearly 7 million a year for all games weather sold out or not.